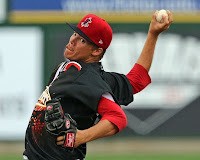 In a week with a number of excellent pitching performances, Lowell right-hander Jamie Callahan (pictured) was chosen as the SoxProspects.com Pitcher of the Week. Pawtucket outfielder Alex Hassan continues to have an excellent 2013 season, and was recognized with his first SoxProspects.com Player of the Week award of the year. In Callahan's lone start, he dominated the Connecticut Tigers, giving up just one hit in six shutout innings. A second-round pick in the 2012 draft, Callahan did not walk a batter while striking out eight, the highest total of his professional career. It is the first Pitcher of the Week award for the 18-year-old. Since returning from the disabled list in early June, Hassan has been a force for the PawSox. Playing primarily right field, Hassan went 10 for 24 with two doubles and two home runs, giving him a line of .417/.500/.750 for the week. Added to the 40-man roster in the offseason, Hassan has positioned himself as a key piece of the Red Sox organizational depth in the outfield. The Player of the Week award is the second of Hassan's career - he was also awarded in August of 2011. Note: Mike Augliera was honored as the Carolina League Pitcher of the Week. It is the second time he has been honored in July, and the third time the award has gone to a Salem hurler. Henry Owens won the award the previous week.